The lovely Sue of Supervery sent me this link today, after the knitted knickers post. Awesome. I love sculpture, the way it can be textural and strong and soft all at once. Much like knitting, really. When I finished secondary school I planned on being a fashion designer, so started a Bachelor of Design at Massey. While writing and analysis clearly emerged as a stronger skill than drawing, I learnt heaps and met some amazing people. 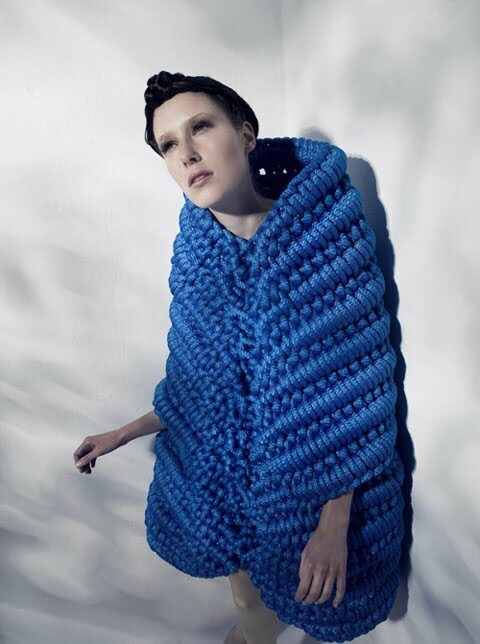 I didn’t meet Ming Wei Li, but he was in the same year and I remember going to the 2005 graduate fashion show to support friends and being blown away by the dimension of his knitted work. And here is a man who could make the hard appear soft. Canova is my Favourite (with a capital F) sculptor. Somehow he manages to capture a gaze, a hand on flesh, a movement, in stone. Knit graffiti got me very curious about the concept of art vs craft, and I love that more crafters and artists are challenging this incredibly old argument. Once upon a time artists were paid for their works according to the cost of the materials, not for the artistic merit. Craft is still judged on the terms of material costs, but with people like Greenbank making acknowledged art from traditionally defined ‘craft’ processes is hopefully going some way towards changing that perception.